The Turf Teq Power Broom has an 18" diameter x 46" wide brush. 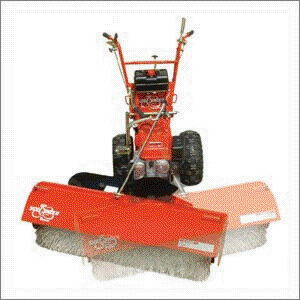 The two speed drive is ideal for both debris and snow removal. Brush pressure, brush speed and pivot angle (left / right) can all be adjusted easily from the operator position. The broom can also be used for lawn dethatching. The unit also features an on-the-go differential lock for exceptional traction and productivity. The hydrostatic wheel drive allows you to adjust ground speed to meet heavy or light sweeping needs. It also makes changing directions quick and easy improving productivity while reducing operator fatigue. * Please call us with any questions about our sweeper 46 inch self propelled rentals in Burnsville MN, Rosemount MN, Apple Valley, Minneapolis, St Paul, Twin Cities, South Metro,and Dakota County.